School board’s high-drama discussion: Are we fair to charters? George McKenna and Monica Garcia in school board debate. If anything, it was good television. 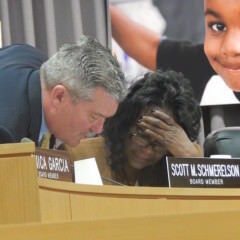 LA Unified school board members confronted each other headlong in a dramatic discussion Tuesday night over whether charter schools were being treated fairly by the district. The discussion opened calls for a deep dive into how district staff comes up with its recommendations for denials or approvals of charter schools. The debate erupted during talks about the renewal and a new application for two charter schools run by Partnership to Uplift Communities (PUC). By state law, the school board oversees the creation of charter schools in the district and renews the contracts for up to five years. LA Unified is the second largest school district in the nation and has the largest number of charter schools. PUC students and teachers cheer after vote. Because board member Ref Rodriguez co-founded PUC, he stepped out of the meeting and watched on closed-circuit live stream television, which is also available to the public. The drama began when recent media reports, including those in LA School Report, were brought up that suggested charter schools were under more scrutiny. 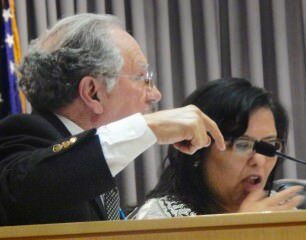 Monica Garcia, whose district has the PUC schools, said flatly, “I think that the politics of the board has changed.” When asked to clarify the statement by board President Steve Zimmer, she repeated the statement. VIDEO: To watch the board members’ debate, start at 5 hours 51 minutes into the meeting in this video. Ratliff asked the chief of the Charter Schools Division, Jose Cole-Gutierrez, why the staff suggested denying the PUC petitions. “It seems like you are saying we are always consistent in our denials,” she asked. George McKenna, the senior statesman of the board and vice president, called out some of the statements by his fellow board members. Sitting next to Garcia, he said he didn’t like the idea that she suggested that charter school decisions are based on politics. Nevertheless, before the night was over, the board would ignore the data collected by the staff and approve the two petitions recommended for denial, and deny one petition for a charter school that the staff suggested for approval. Attorney David Holmquist consults with Superintendent Michelle King. McKenna also called out Zimmer for asking Cole-Gutierrez if he believed that PUC could change in the future. McKenna said they should stick to the data. “I love these kids, love them,” he said, looking down at two 10-year-old fifth-graders who waited eight hours to testify to the board. Ratliff retorted, “I’m offended actually with what you are saying.” She said she wasn’t questioning the data from staff, but simply the history and procedures based on allegations by the charter school petitioners. During the entire debate, in an audience filled with about 75 people, Zimmer allowed the discussion to continue. He even allowed for a straw vote, which he called “unorthodox.” He turned to new Superintendent Michelle King sitting next to him and asked if she had an opinion, and she reminded him that the staff decision had to be signed off by her. For the petition to open the PUC International Preparatory Academy, the board worked out approving the school for only three years, negotiating up from McKenna’s suggested two years so the school can have data showing improvement rates. That vote ended with all voting for the school except Zimmer. When Rodriguez returned to the room after the votes, he gave a wave to his former PUC colleagues. In an interview with LA School Report on Wednesday afternoon, Rodriguez said he has yet to speak to his fellow board members about the debate the night before, but he found it all fascinating.